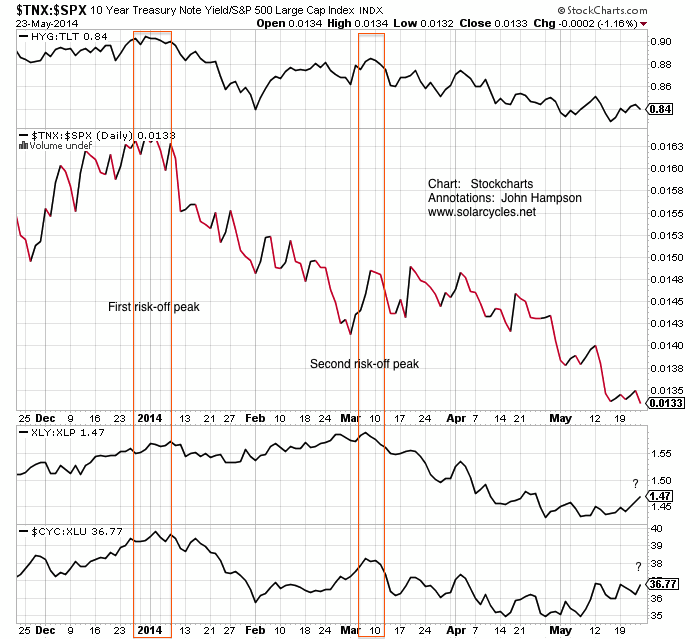 We can see the relative performance of cyclicals just turning up again recently in the bottom of the chart above. The Nasdaq 100 and Russell 2000 perked up last week too. So might we now see all-round bullish resumption? Small caps and tech corrected by price and large caps corrected by time? 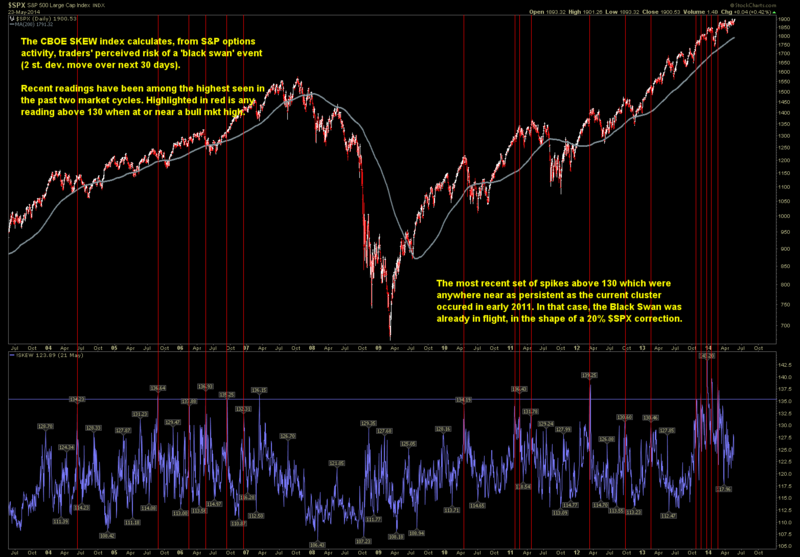 Well, neither saw the requisite wash-out in indicators to reload the bull. 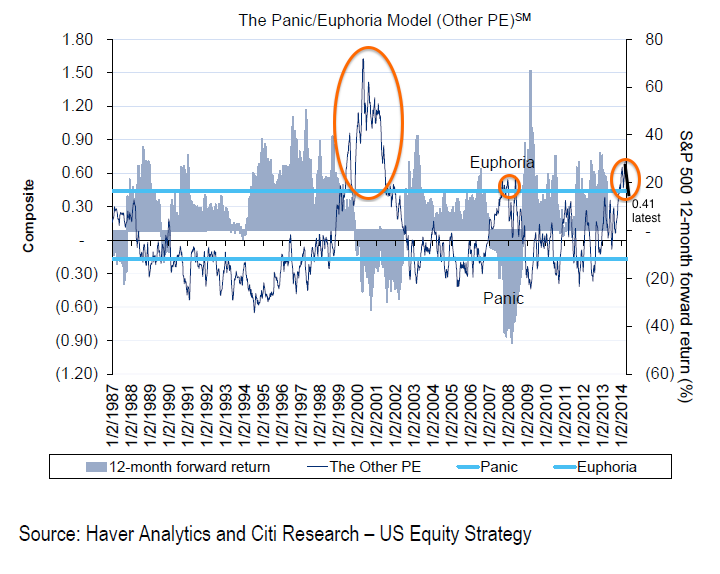 Investors intelligence sentiment has stayed elevated, volatility low and euphoria present. The negative divergences have not been resolved, but worsened, and various indicators continue to be at historic warning levels. All these suggest it is more likely that large caps fall imminently and join the other indices in a true correction, rather than we now see broad bullish resumption. Note though that short interest is a component of the panic/euphoria model above which is more bearish than bullish, but nonetheless we could potentially have room for another leg up in the summer before price finally turns over. In both those cases prices broke upwards around the end of May out of a trading range. However, know that leverage did not peak until October in 1929 and September in 1987 respectively, whereas it appears that leverage peaked out in February 2014. We ought therefore to see margin debt reverse the recent declines and rally to new highs to enable a further significant rally in equities. There is no demographic tailwind. Leading indicators have been pointing to a mid-year pick up in the economy and economic surprises are now trending upwards again for the US. Might that also fuel such a final mid-year up leg, before falls in the Fall? It would fit with the seasonality of geomagnetism, whereas the Presidential cycle suggests trouble as of now. I continue to believe the development of the solar cycle is key. If the waning in sunspots continues (and May is likely to print a 3rd month of declines from the Feb peak) then we should see stocks and the economy turn down together. Margin debt and small caps are leading the way and the rest will follow. If, however, the solar cycle has a sting in its tail and prints an anomaly like SC16 (belated monthly sunspot spike) or SC5 (belated smoothed maximum), then we should see speculation in assets and activity in the economy continue to bubble away and margin debt make higher highs. So we can continue to cross-reference. For now, the balance of probability suggests the solar cycle is now on the wane (sunspots since Feb, solar scientists’ predictions, bulk of previous solar cycles compared, margin debt decline and froth stocks peak Feb-Mar), and the balance of probability suggests large caps will tip over imminently and join small caps in true correction, and that this is the last gasp of the cyclical bull. There are too many bearish indicators, divergences, and red flags to enable a bullish resolution here. For stocks to break up and out of 2014’s trading range, we would need to see repairs to volume and breadth and risk-off money flows, and we would need to print anomalies in some historically reliable indicators. Failing that, it looks likely that the SP500 will be repelled again at the top of its arching-over price range. With Monday a US national holiday, there is just one trading day before the new moon which could then initiate renewed downside as lunar phase extremes typically do a good job of marking trend changes when price action is overall choppy. In summary, the case is still overwhelmingly bearish for US stocks, and my primary scenario is that prices are arching over into imminent hard falls, to correct the multitude of extremes in valuations, sentiment and technicals that have been in place for some time. Small caps, tech, margin debt and sunspots all look to have peaked around February and I expect large caps to fall in line. However, there is a lesser case for another bullish leg over the summer before hard falls in the Autumn, and that remains my worst case scenario. If that is to occur though, we need to see supportive developments in volume, breadth, cyclicals and other indicators. I continue to attack and trade short, and look to this week’s new moon for another potential definitive peak in the SP500. I think key to the next market move will be the outcome from the ECB meeting next month. There are great expectations on the ECB to act to curb deflation. If Draghi announces QE we will likely rally imo. Draghi started the rally back in mid 2012 with the “we will do anything protect the euro”. Will he be the one to kill the rally? we will do anything to protect the euro!!!!! It is asking for trouble but that’s what I see. A key part of it – the influences of the sun – is beyond the consideration of almost all market participants. Indicators such as panic/euphoria, put/call, rydex, investors intelligence, margin debt show investors collectively all in long, rather than all short. ES contract exactly on resistance line connecting March 7th, April 4th, May 13th tops. Chances of strong breakout with such low volume and lots of complacency as seen in VIX are slim but should not be underestimated. If we cross that line volume will surge as this will squeeze even strong hands among shorts. Last Thursday and Friday was small short squeeze on low volume. This week and especially today is key. 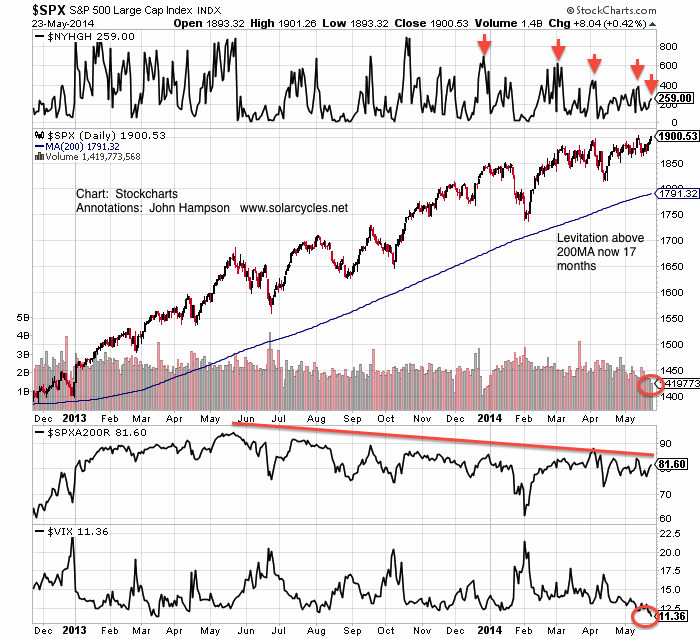 Last Mondays were bullish…. but that may have been discounted on Friday. Good luck. Of course Tuesday is key as today US markets are closed. If there were another leg up do you have a view on potential size of the move? Your examples above suggest something in the 16%-20% range. Just considering money management strategies. If we see small caps and tech make a lower high then that would imply a fairly small breakout in large caps. If none of the markets have topped yet (I rate that low probability) then we could see something bigger. Thanks, looks coincident to me: Ted took off as the market fell. My ideas mesh substantially w/this guy’s analysis. Just another opinion as the market marches higher. that wave trader guy’s opinion chgs almost daily…tune him out. John, I like your posts, but I think at this point, you have to be honest and say that the top is NOT the start of the year. That is pretty much invalidated but the constant new highs, abet small amounts at a time. I believe that a 20% decline in SPX or 30% decline in the Russell would be enough of a correction, for the next bull market, just like in 1990 where that was all the bears got. Like 1991 and 1992, 2015/6 are the good years in the presidential cycle. In addition, 1990 was a solar maximum and we had an Asia peak. The other datapoints you quote, do not extend that far back. Thus, there is no evidence that this is a 1929 type waterfall, vs a 1990 type 20% correction during the summer and ending October. Likening the current economic environment to the one in 90s does not seem warranted, personal wage & salary income (as shares of GDP) was indeed rising during that period while it is now at the lowest level since 1960. Not to mention the dismal GDP growth in recent years. If there is one, the fundamental factor for perpetuating this bull market is the ongoing gigantic transfer of wealth from the populace to the 1% through the QE backdoor. Sadly, we are both bears who are just splitting hairs at this point. Does it really matter if the market keeps going up? But anyway, my studies show that GDP growth levels do not really lead to market gains. GDP revisions do. Japan had 6% GDP in 1990, but it was a SELL. Japan GDP hit 0% mid-1992, but it was a fantastic buy for 6-12 months. I would be interested in the salary data you mentioned, and if you did a study with stock prices. I did such a study with GDP and showed zero correlation since 1900. The big macro factor is the trade surplus that Asia had vs the US in 1990, and how it unwound. Japan in 1990 and China today. In addition, the massive debt writedowns that will occur in Asia are similar. Couple that with the solar maximums in 1990 and 2013. Anyway, those are my reasons for comparison. The problem is that Shanghai has already crashed, and as I stated, the US did not go down much in 1990 — although I am sure many would love a 30% drop in the Russell which we did get in 1990. So what is our best play right now? Thanks for the thoughts, John. My quick response is Japan had largely deleveraged at that point when their GDP hit 0%, but here the Fed is still continuously inflating the asset prices while the US GDP is not responding favorably. So the situation is different. John, personal wage & salary income (as shares of GDP) were generally positively correlated to the rising bull market in 90s, especially toward the 2000 top. However, since the 2008 financial collapse, they are disconnected, that is: personal wage/income (as shares of GDP) has been declining (now lowest level since 1960) while the stock market keeps rising. It is unlike the situation in Japan decades ago. 31 Dec is still relevant, namely as the Nikkei peak, the Dow inflation adjusted peak, and various cross-asset peaks, as per the risk-off chart above – all subject to developments from here of course. But the true peak looks like end of Feb currently: solar cycle peak, margin debt peak, RUT, Nasdaq and IBB peaks. I too am hoping for the same John. I am just trying to keep us honest…at least I have to keep my powder dry until the real war begins. I disagree with the inflation adjusted dow. If you are using it to get “real” returns, you have to use the total return index with dividends, since they are “real” too. I believe that will still get us to new highs today. I have no doubt that all indices will peak on different dates, and they did in 2000 (NDX/INDU/SPX) or 2008 (SPX/EWZ/FXI). Divergences almost always occurs in peaks. 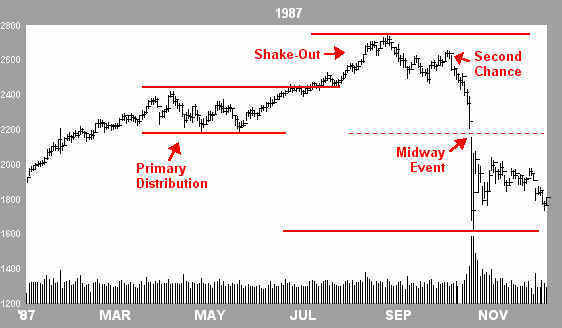 I do agree with the Nikkei peak — and it is so familiar vs Nikkei in 1990. But I think it is a red herring — the speculative mania is in Asian real estate, or in Tech/Biotech/Consumer Fads. As bitter the pill is, I have to follow the mania, rather than the beauty of a chart peaking at the turn-of-the-year. I have no doubt that Japan will decline, but it is not my index of choice to be tracking when this mania peaks. As for IBB, I think it is a red herring too, as it is a small cap ETF with little AUM. If this is indeed an 11-year cycle, I expect a large following, for example, QQQ or AAPL. That is not to say IBB will not go down MORE than QQQ. 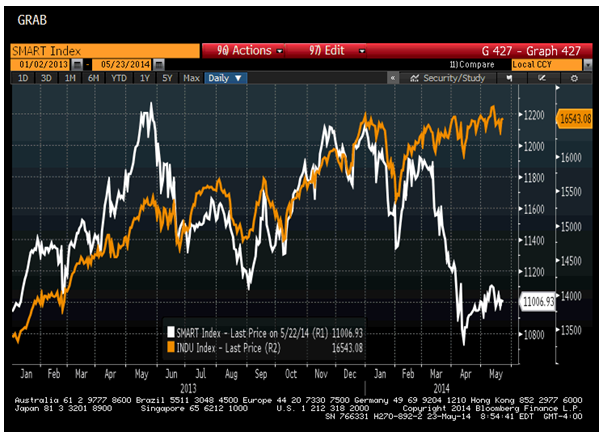 I am discussing which index to help us time the peak here, not which index to short. I am not sure if my rant is helping or hurting. I see that you have twenty charts at a time, but if we cannot agree ahead of time which indices to follow, I am sure many here will think we are cherry picking only the best to suit our argument. The distance between peaks of Brazil vs China in 2007/2008 lasted as much as 8-10 months. Thus, even if Nikkei peaked on 1/2014 — the bears might have to wait until 10/2014 for the other indices to peak. The indices that leaves hope for the bears are the Nasdaq Composite and the Russell 2000 — it is widely followed, and still shows a 3/2014 peak. The demographic peak and real estate peak in Japan was in 1991/2, The demographic peak in China was in 2012/3. The real estate peak in China is 2014. In 1990, the market crash before these peaks — this time, it is clearly different. I hope just delayed. I believe that we have a good chance of peaking around 7/2014 and having a relatively small 30% crash in the US until 10/2014. From there, GMO might be right that the presidential cycle takes over. Even if I do get that move, as a bear, I would be very frustrated and feel that this whole move is anti-climatic. As more onshoring returns from China, the US economy might surprise to the upside, as it did in 1991 as we took back the reins from Japan. The worst case would be the solar max of 1959 — we didn’t get any correction until 1962. That is 3 years of waiting for a 28% drop. Do you think that might happen? Did you guys see this talk that long-range weather forecaster Piers Corbyn gave at the Electric Universe conference a few weeks ago? His predictions chime well with your work. Meanwhile, OTOH in bullish news…. you were citing the decline of BTCUSD as evidence that a speculative peak was behind us. It still may be, but BTC has broken north on increasing volume the last couple of weeks. Ultra, Ken Ring is probably the best long range forecaster I have ever read. His method uses moon cycles and orbits. The progress of SC24 so far provides the evidence that he is correct! Market guy: His thesis of an ending diagonal has been in place for over a month now. That’s his problem. (And many other’s too.) They focus too much on short term fluctuations; which imho are mostly random. And, if they are not random; it isn’t worth the effort trying to find and trade the non-randomness. Thanks Mark. It is very interesting to read that article and see how the sun/moon/Jupiter/Saturn cycles he mentions chimes with my own 17.6 year stock market cycle. Ken Ring mentions the 8.85 year perigee cycle (half of 17.6?) 35.4 year cycle (2 x 17.6? ), 71 year cycle etc. Now of course, it may well be that my cycle should be 17.7 years or thereabouts, but no matter as I don’t pretend that it is so precise, just an indication. Diamond pattern breakout: usually these are continuation patterns. Projects to 10,600 on the Dax. You constantly hear about the “decay” issue in regard to ETF instruments, but that depends entirely upon which side of ledger you sit. No issue if you had bought and held XIV since 2011. XIV is unusual in that it takes advantage of the forward roll of VIX futures. Virtually all the other VIX etf’s have decay problems. I believe all of the 2X and 3X etf’s have decay problems. 3X etf’s have pretty serious decay. I would use them only for day trading. But XIV is good one to buy and hold if you’re betting on the market continuing to go up. And I said last week that gold was near a break up or down. We now know which way it is. Perhaps a move to $1200? Either way I way I am stopped out for a loss. It appears that market participants are subscribing to a goldilocks economy when both stocks and fixed income are winning amid meager growth, low inflation, and an ultra friendly (“may I stuff money in your pocket”) monetary policy. Unless a black swan emerged out of the blue, I see 2014- the year of consolidation and doing more of the same things that work is my strategy….owning both stocks and fixed incomes.. I am sharing my opinion based on what is happening to my portfolio. I am not trying to help anyone. You have to help yourself. When does the market break? 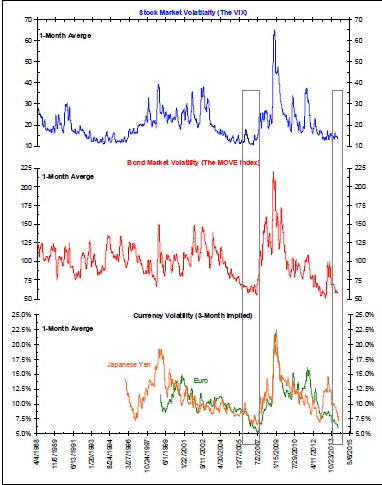 When will the Narrative of Central Bank Omnipotence fail? Game theory provides an excellent tool kit to unpack “socially-driven dynamic processes”, whether that’s the common knowledge that the Fed will always bail out the market or the common knowledge that gentlemen should wear long wigs in public. That fashion Narrative lasted for 150 years, and there’s no inherent reason why the current investment Narrative can’t do the same. But there are indicators we can all monitor to gauge any cracks in the story, as well as the timing of potential dislocations. I think Salient partners specifically stated that correction is possible in the current narrative. It is just that central banks can prevent a total collapse. A reasonable guess is when, starting the 3rd quarter, the QE liquidity punchbowl is taken away (coupled with a surprise by ECB), the stock markets briefly crash, then after a certain time the Fed reverses course to launch an even larger QE to again ‘stimulate’ the weak economy, that is when the narrative of central bank omnipotence starts to fail. Ben Hunt, the author, has said previous that the price of gold is a big cue for him in terms of CBs “losing control” and markets embarking on a correction. Interesting to see gold is down big today (a point in favor of Ben’s thesis). As in the above zerohedge link (shares buyback all time high) that you shared above, the truth is: all are in fact long, so the market should only go down based on your reasoning. Could have fooled me – I see everyone being long!! Sorry, I mean the zerohedge link (shares buy back all time high) that Allan shared below. I’ve been following John fo a while. But, he appears to be on the wrong side of the bet. So WHO is buying?……….like I said weeks ago. The ONLY way that execs can get their bonuses. And why this will end so very very badly. If I hear one more Wall St pleb try to tell me how much cash companies have I’ll eat my own head! Look at the other side of the ledger! Mr Bernanke et’al can be proud of the fact that record low interest rates kept indefinitely artificially low have created a corporate bond nightmare that will eventually detonate a global economic disaster. Folks, I’ve found it very amusing that you are starting to doubt John’s theory. 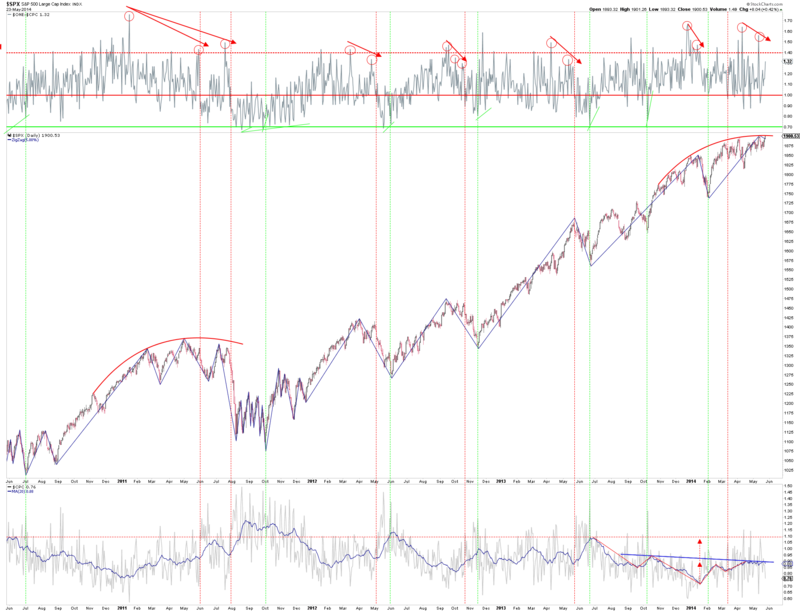 The technical indicators don’t lie and historical data does mean a great deal. Please give yourself just a few more weeks, or even a few more months before you start saying John’s wrong. At this point, I am not so sure about the 1929 type crash because of the QE and the surprised good economic news, but the correction is imminent. I don’t think anyone is doubting John’s theories. And by correction I meant 10% to at least 30% correction from the current high. 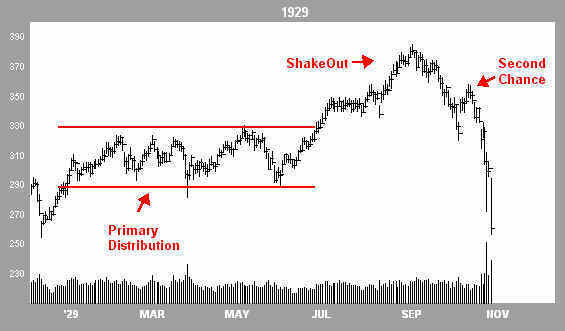 If 1929 pattern serves as any indicator, we shall start seeing some sell off on 06/05 as a prelude to the major waterfall selling by 06/13. Can you please elaborate further on your Lunar calender cycle? Jigs – although the shorter cycle lasts one lunar year, and the longer cycle four solar years, they are in fact both based on the lunar orbital cycle. I do this because that is the only obvious cycle that is regular, is known in advance and also is not already priced into the markets. For simplicity I use the dates of full moons for timing. I’ve found that each market exhibits changes in sentiment during each cycle, and that these changes form reasonably predictable patterns of highs and lows. And because they are based on the moon’s orbit, they can be calculated in advance. For example for SP500, the longer cycle was due a low on 19 March 2014, a high on 27 Dec 2014, a low on 7 Oct 2013, a high on 18 July 2013 etc. For the shorter cycle, a high was due 14 May 2014, a low on 15 April 2014, a high on 6 March, a low on 5 Feb etc. The next turn date is 11 June for both cycles (sorry, I miscalculated the 14 June date mentioned above). The longer cycle shows 11 June as a high, and the shorter cycle as a low. 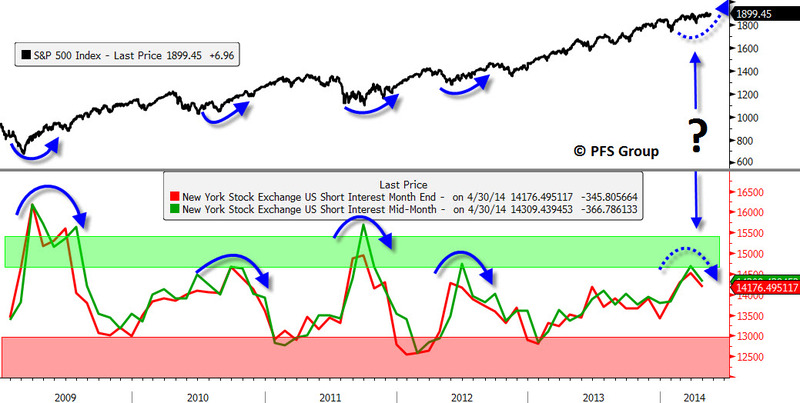 But the shorter cycle is inverting, because SP500 is going higher since 14 May. So the 11 June turn is most likely a high for both cycles. If you mark these dates on your chart it should all make some sense! While the NASDAQ and the Russell 2000 indexes are still well off their highs, other indexes like the S&P 500 are hitting all-time highs and the recent move is drawing many skeptics. Many bears are calling the breakout in the S&P 500 as a head fake and cite the lack of volume supporting the move higher, but a look at internal data would suggest otherwise. For example, the cumulative advance-decline line for the S&P 500 (blue line below) hit a new high to confirm the move higher, which implies there are more stocks rallying than declining. In terms of a lack of volume, while overall volume is low, what matters most is that up-volume is greater than down-volume and the net balance as measured by the on balance volume indicator (OBV, red line below) suggests there is clearly more buying than selling as the bulls outnumber the bears. Given the internals shown below, the bulls’ grip on the market continues to strengthen. The title of the blog is. Signs of a market bottom are building. Without doubt Chris Puplava should be taken seriously. He produces well formed and rounded analysis. As I said a few days ago i think the problem is that the market rally from the Feb lows was negated by the Ukrainian crisis leaving the rally under – extended. The current rally will probably do the trick. As in Puplava’s post the number of people with a neutral stance has hit record highs. A sharp rally will draw people in and force mismanaged bears to cut…….then a correction can take place maybe down to 1700 – 1750. North of 1950 would probably be enough to lance the boil.